Toward the end of her remarks last night (at about 18:00), Omar alluded to her criticism of Saudi Arabia in connection with the murder of Jamal Khashoggi. Omar presented herself as a neutral critic of all countries that abuse human rights. I think she has missed quite a few so far, and she has certainly missed the heart of the subject when it comes to Saudi Arabia. If this was also intended to explain her focus on the Jewish state, it fell a bit short. Omar is a raving Islamist supporter of BDS with a focus on the alleged failings of the Jewish state, but she isnt too crazy about the United States either. 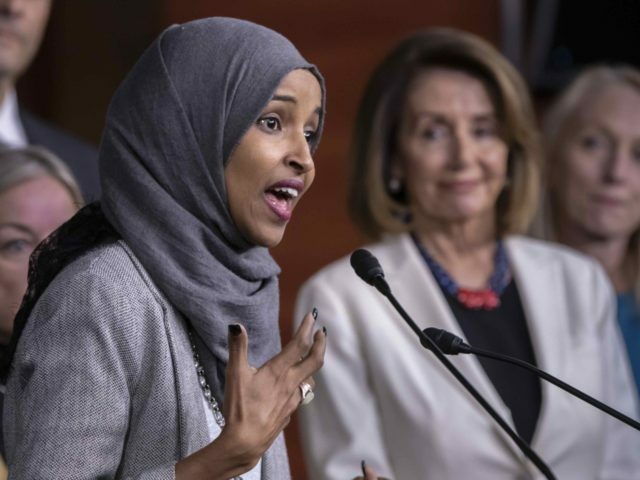 As always, however, Omar portrayed herself  a Somali Muslim refugee to the United States from a Kenyan camp  as a victim. Heres the truth. Far too long we have lived with the discomfort of being a second-class citizen, Omar said. Frankly, she declared, Im tired of it and every single Muslim in this country should be tired of it. At around 11:30, she depicts the denial of hospital services to herself and other Muslims. She conjured a parade of horribles. The video is 21 minutes long. Its a slog. Omar is an attractive woman until she opens her mouth. Listening to Omar is not a pleasant experience. It is an ordeal. I can only say that attention must be paid. He was a member of a terrorist organization (several really) and a legitimate military target. The world is a cleaner place now that he is dead. I’m still cursing just reading one line that she said. She’s gonna find out the HARD WAY that she ain’t home. her home is a long ways off in some backwards African country. But if she want things to get violent, she’ll be sent home to allah along with all of her friends at CAIR. At this point Jewish donations to the D party should end up slashed by half. It’s like if a LOT of Republicans stood by David Duke. Except the msm doesn’t report about the dems’ backstabbing of Jews. Since political correctness seems to be the law of the land instead of the Constitution, expect more ‘Omars’ in the next election. Several good women have been sounding the alarms on slam for years, but few have listened. This is the result. Omar is an attractive woman until she opens her mouth. She and AOC are the mouth of the DNC. I am hearing from regular folk out here in the hinterlands. No one likes AOC. You say "AOC" and they all know who she is and they don't like her. Even regular democrats who are not politically active which is the majority of them. Omar needs to keep opening up her mouth. Between her and AOC regular people are getting a belly full of their true intent. Pass them a microphone 24/7. And the DNC is rapidly becoming another Islamic front. David Duke now supports Omar’s statements about Israel. One thing for sure Nazi facists like the KKK have no love for Jews. This stupid fool thinks she's in the Third World. They try that gambit here.....we call the cops. There are 50 countries around the world that identify as Islamic. There's something sinister about them insisting they need America to "legitimize themselves" (this according to preacher Omar). 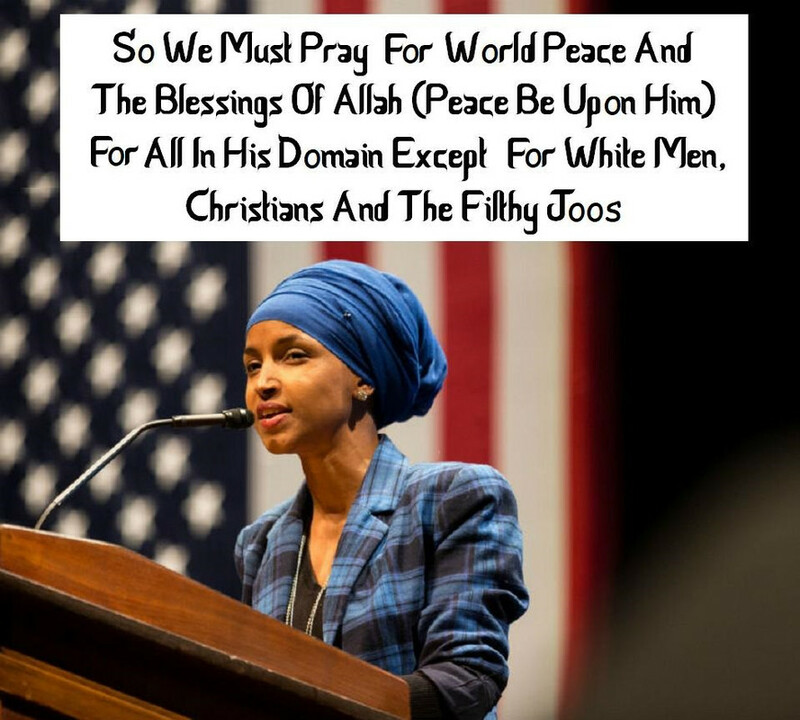 Omar's so stupid......she actually believes Americans will bow down and submit to her and her comrades. Better believe "That aint never gonna happen, sweetheart." The word Islam means submission.......these people wants us to submit to Islam and to install Sharia law in our nation. There’s something sinister about them needing America to legitimize themselves (this according to preacher Omar). Clearly, they have a hidden agenda........one that is not compatible in a republic. No one here will ever allow themselves to be dictated to by Christian haters Omar, Tlaib and the rest. These haters use the crutch of their so-called religion to hate Jews and Israel. Judaism does not destroy others who are not of their faith. Judaism as a religion is not homophobic, misogynistic, bigoted, or violent. Jews contributed to American values. Judaism is not trying to destroy the USA. Omar is fighting America...she hates this country and all we stand for. Electing her to our congress and Nancy placing Omar on the House Committee on Foreign Affairs is tantamount to placing her on the Ethics Committee...Omar is restrained in all things mentioning freedom of religion; she is restrained in her reliance of American Constitutional Law as she is restrained in upholding American Law.....she has reportedly married her brother in order for him to gain U.S. Citizenship. I do not think Omar can truthfully honor her oath of office as a Muslim. ": I, AB, do solemnly swear (or affirm) that I will support and defend the Constitution of the United States against all enemies, foreign and domestic"; - " that I will bear true faith and allegiance to the same;"Since this oath of office was not appropriate, several elected This year, members of the most diverse Congress ever opted for over a dozen different religious and non-religious texts in their swearing-in ceremonies. Diversity and Political Correctness will be the undoing of the Republic, America as we know it. Oh! Oh! I googled the “head” thingee and found that it’s worn so as to cover up the neck - don’t know what it has to do with the hair being covered - but it’s required so MEN - oh! those horrible men - can’t see what’s BELOW the neck and be tempted but lo and behold, look - you can see some of her chest in that picture. Otherwise, makeup and jewelry are just fine! I guess that’s not to look attractive for men!! Go figure! THIS JUST IN: A 12-year-old boy held hostage in Bandipora, Kashimir, India for around nine hours was killed Friday by Muslim militants before they were gunned down by security forces, police said. While the boys uncle, who was also held hostage was rescued Thursday, police said militants refused to let the boy out despite pleas on loudspeakers by his family. The jihadis apparently thought that by fleeing, they were siding with unbelievers against the believers, and therefore the boy could lawfully be taken hostage and killed.